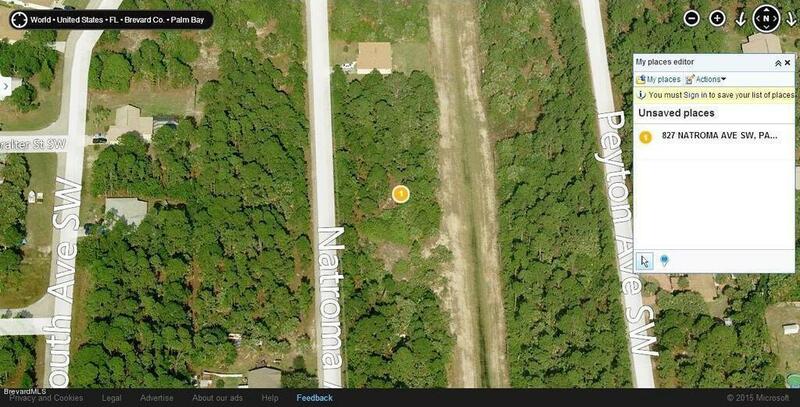 0.23 acre residential lot (Rs2 Zoning) available in Port Malabar Unit #36 of SW Palm Bay. Nicely located in the SW Section of Palm Bay just south of Malabar Road, this lot is minutes away from Jupiter Elementary School, Publix Shopping of Bayside Lakes, and the U.S. Post Office. You're just 1/2 hour to the Melbourne International Airport and the beaches in Indialantic. A great place to build your new home! From Exit #176 of I-95 go west on Palm Bay Road NE. Turn left on Minton Road and proceed south for 2.5 miles. Turn right on Malabar Road and proceed west for 1 mile. Turn left onto Garvey Road, right onto Harper Boulevard SW, left on Natroma Avenue SW. The destination will be on your left.